When a loved one becomes seriously ill or critically injured, unable to communicate, will you know their preferences for medical care and treatment? Although much of life is about planning – grocery lists, household budgets, weekend activities, many studies have found that most American adults have devoted no time at all to prepare for what should be among our highest priorities: future healthcare needs. Hope HealthCare Services has launched a community-wide campaign to encourage this decision-making process before the need arises. Discussing these wishes with loved ones and sharing them with the family physician will help to ensure that the choices are understood and followed. The completed booklet should be kept in a location known to the family. 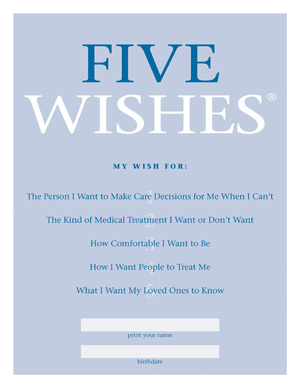 Hope has set a goal of placing Five Wishes in the hands of 10,000 people in the community this year. Everyone is invited to participate in 50,000 Wishes for Hope. Five Wishes is considered a legal document in Florida and 41 other states, and in most cases, does not require the participation of a lawyer or notary. To request a complimentary copy, call (855) 454-3100, or email@hopehcs.org. 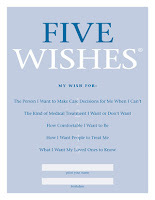 The document can also be downloaded at www.hopehcs.org/fivewishes.